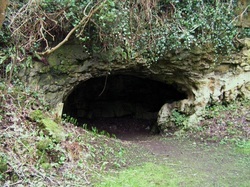 Outside Ballyshannon and further along the road from Abbey Assaroe you will come to a turn off for Catsby Cave and St. Patrick's Well. At the small carpark you walk to the left to Catsby Cave or right to St. Patrick's Well (Read about St. Patrick's Well in our HOLY WELLS section). When you take the left walk and walk down to the river you can see an old mill wheel which it is thought dates from Cromwellian times. There are also two mills, the upper of which was a flax mill and the lower a scutching mill. 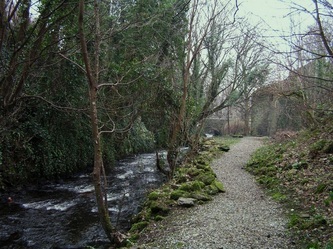 The mills were worked by the monks from nearby Abbey Assaroe. The mills fell derelict but were totally restored by the Abbey Mills Restoration Trust when the acquired them in 1989. 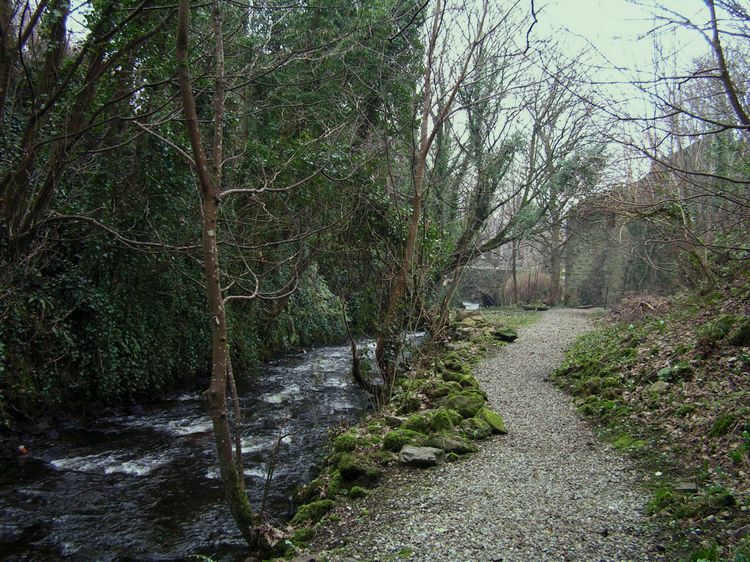 One of the mills now houses an audio-visual presentation telling the history of the medieval Cistercians in Ireland and the other houses a small cafe overlooking the river. The mills are open to the public during the summer months but you can still walk to Catsby Cave outside of these times. See also MASS ROCKS. Dotted around the grounds you can view the original stones saved from the ruins of Abbey Assaroe. There are more of these stones in the museum at the Franciscan Friary at Rossnowlagh. The small bridge you see to your right before you walk the path to Catsby Cave is thought to have been built by the monks of Abbey Asseroe and is probably the oldest bridge in Ireland. 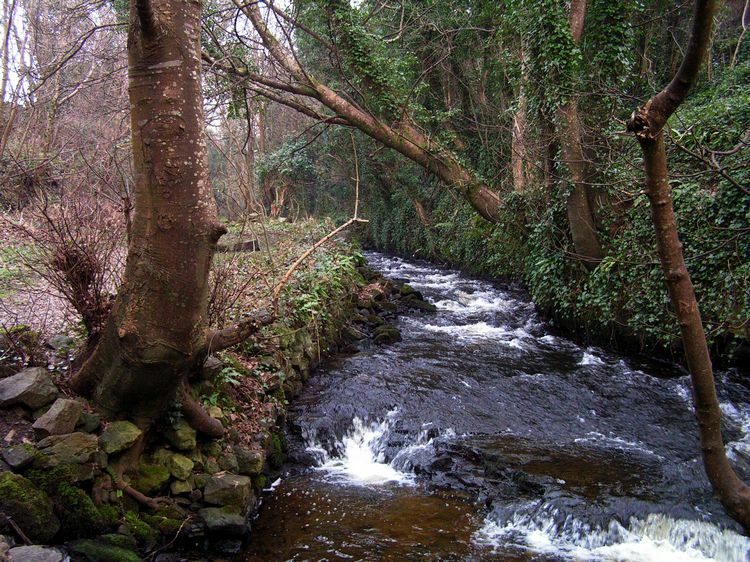 The riverbank walk to Catsby Cave is very pretty with the small river rushing by to you right and lots of greenery from the trees all around. The Cave was a place where mass was said during Penal Times when it was forbidden for Catholics to practice their religion. There are many such holy places around Donegal (and Ireland) and by necessity they were in hidden places where mass could be said without fear of being caught or at least in places where a look-out could be placed to warn of approaching danger and so the people dispersed before they could be caught. It is interesting to imagine this as you take the riverbank walk and imagine all those people from many years ago walking this rough path, probably bare footed, simply to practice their faith. 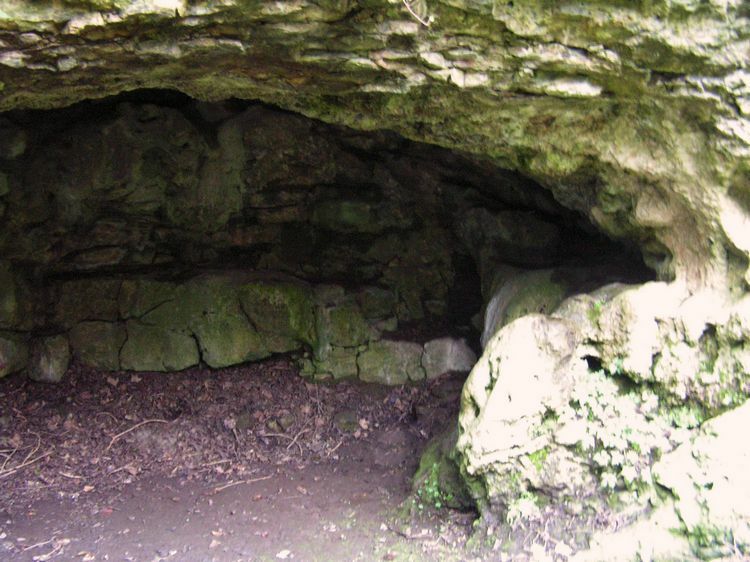 You will then come to the Cave, which is not really a cave as such but rather an opening in a wall of rock. 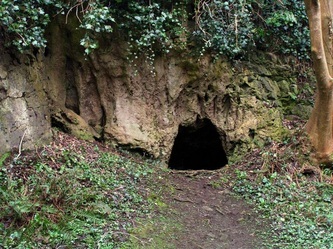 It is just big enough for one person, perhaps two, to stand in and would have been the place the priest stood to say Mass, his flock gathered around the cave on the open ground in front of it. 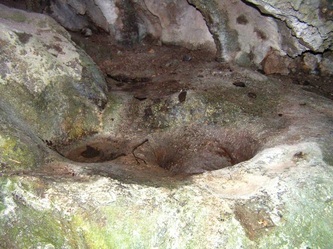 Inside the Cave there is a rock with two hollows carved out of it. The larger hollow would have been for Holy water, the smaller for Blessed Salt.